In some ways, the 2017 album To the Bone introduced a more user-friendly Steven Wilson. Certainly, Wilson’s fifth solo full-length features a good deal of the musically ambitious progressive rock styles that led to his being named Prog Rock King by the 2015 Progressive Music Awards in London. But the record also finds Wilson displaying his knack for writing accessible, popular music, the sort of songs that in an earlier era might have earned the label of “radio-ready.” But for the 51 year old Londoner who just released a 2CD+Blu-Ray live set, the pop textures of songs like “Pariah” and “Blank Tapes” merely represent the pop side of his myriad talents. For the open-minded fan, the musical journey upon which Wilson has been traveling is a fascinating one, full of perhaps unexpected twists and turns. But for the music fan who prefers an artist who crafts a specific approach and then sticks with it, Wilson’s work maybe too challenging. “Everyone loves AC/DC, but they’ve basically been making the same record for 40 years,” Wilson offers by way of example. “Which is fine.” But that approach isn’t one he’s likely to adopt. Wilson mentions the names of just a few of the many artists whose work has inspired him: Todd Rundgren, David Bowie, Peter Gabriel, Prince. He describes the unifying characteristic as “that category of people [who] constantly reinvent themselves, constantly confront the expectations of their existing fan base.” He says that such artists “constantly shift the goalposts around, so their fans never really know what’s coming next.” And he acknowledges that approach is a tightrope walk. In an interview clip included on the Blu-Ray version of Wilson’s new Home Invasion: In Concert at the Royal Albert Hall, Wilson forthrightly acknowledges that some of his longtime fans actively dislike To the Bone. He goes so far in the live introduction to “Permanating” to remind the audience that after the Beatles, the greatest pop group ever is ABBA. After launching into the irresistibly catchy tune, he welcomes a colorful troupe of Bollywood dancers onto the stage; at one point during “Permanating,” the dancers run in a circle around Wilson. That’s not the kind of entertainment fans signed up for when they bought the heavy prog-metal of Porcupine Tree’s Fear of a Blank Planet or The Incident. While Wilson is careful not to compare himself or his work to that of, say, Neil Young, he makes a point about Young’s body of work. “You may not necessarily like everything in it – and I don’t like every Neil Young album – but I totally respect his right to have made all of those career choices. And I’m still fascinated by the fact that he made those career choices.” Wilson feels similarly about the work of Frank Zappa. “I don’t like all Zappa records, but I own them all,” he says. He says that the mere existence of some works that he might not personally enjoy remains part of the artist’s overall appeal. “And I hope my fans have come to expect that about me, too,” he says. While Wilson nearly always has very specific ideas about how a piece of music ought to sound (“I am a bit of a control freak when it comes down to it,” he admits), the songwriter/producer/multi-instrumentalist frequently collaborates with other artists. 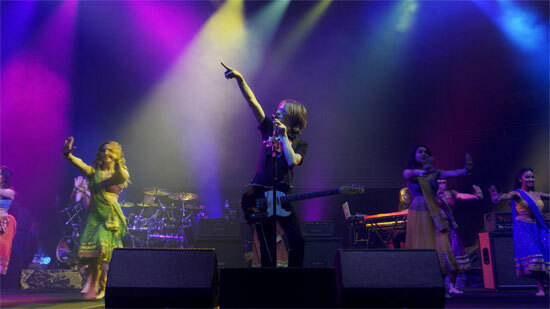 Many of his long-term and/or ongoing projects have been the product of teamwork: no-man (with Tim Bowness), Blackfield (with Aviv Geffen), Storm Corrosion (with Opeth’s Mikael Åkerfeldt). Even Porcupine Tree – in its earliest incarnation when Wilson was still in high school – was a collaborative effort with friend and classmate Malcolm Stocks. Wilson’s embrace of pop and his willingness to share the spotlight has resulted in a clutch of guest vocal spots by (and duets with) Israeli vocalist Ninet Tayeb. Tayeb’s lead vocal on “Routine” and “Ancestral” from Wilson’s 2015 release Hand. Cannot Erase. set the stage for her increased participation on 2017’s To the Bone. Tayeb’s breathtakingly expressive (and technically impressive) vocals on “Pariah” also demonstrate Wilson’s facility at writing vocal parts for a singer with a much different range than his own.